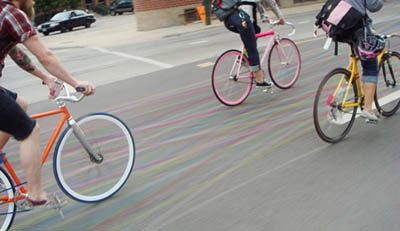 Following the Lightlane concept, Streetsblog posts about “Contrail,” a frame-mounted chalking device that leaves a trail behind. Cool, but probably not so practical in the weather. Suggest a better idea is to create GPS contrails by equipping commuters during Bike to Work month with GPS units. Then auto-upload them to a municipal community, and share rides, like the CopenCycle concept. Note: That’s a photo simulation of Contrail in action. Credit Jessi Pervola and Studio Gelardi. Treehugger picked up the topic and it’s from a 2008 Design 21 contest. The Power to the Pedal contest has a plethora bike blog topics, including Road Share: Bicycle Social Networking. The Bike Remora – attach your bike to a car for a while for a break – that looks like a curling stone and the awesome Sound from the Wind.